HydraCHEK is a fast and user-friendly analytical solution that measures the concentration of hydrate inhibitor and salt in produced water samples taken from a pipeline. It provides a convenient way to monitor the hydrate inhibition of a production system and avoid the significant costs of hydrate inhibitor over use. HydraCHEK has been extensively tested in the field and has been proven to develop robust calibrations for detecting different hydrate inhibitors and salt. Ultimately, HydraCHEK is an economically ideal solution to the excessive hydrate inhibition issue and that is why it is in everyday use by major operators around the globe. How can HydraCHEK measure both salt and hydrate inhibitor concentrations simultaneously? HydraCHEK measures two independent physical parameters; the speed of sound and the electrical conductivity to determine two unknown parameters; hydrate inhibitor and salt concentration. The measured speed of sound and electrical conductivity of a sample are input into an artificial neural network correlation that allows both the salt and inhibitor concentration to be determined. How is your salt concentration determined? HydraCHEK measures both the electrical conductivity and speed of sound of the aqueous phase. The measurement of conductivity is very sensitive to the concentration of salt in solution however the overall measurement of salt concentration for a sample is a combination of both speed of sound and conductivity. Is this a membrane type of measurement? No. 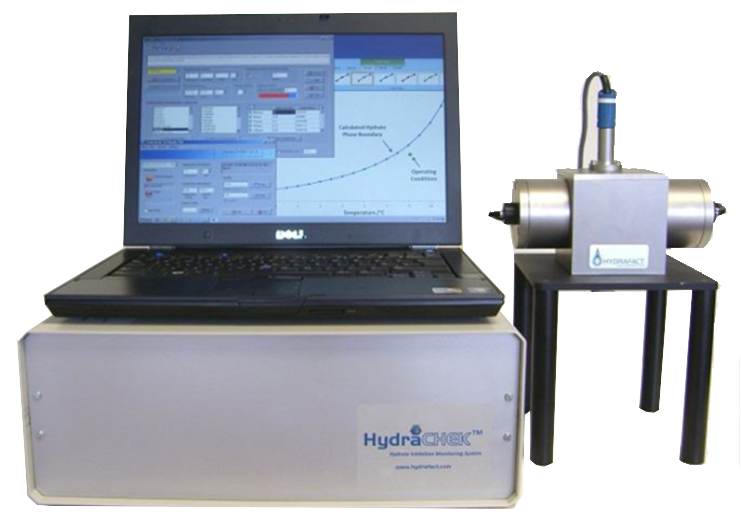 HydraCHEK measures the electrical conductivity and speed of sound of a produced water sample. Is the measurement similar to that of a TDS meter (total dissolved solids)? It is similar, but not the same. TDS may include fine solid particles in addition to salts whereas the HydraCHEK salt measurement will not be affected by these solids. Do you measure ionic strength via the conductivity measurement? No, because in order to measure ionic strength we would need to know the concentrations of all ionic components. This would be problematic in field conditions where salt concentrations are fluctuating over time. Has HydraCHEK been tested in the field? We have done extensive testing and evaluation of the device under field conditions in both onshore and offshore laboratories around the world. A number of leading operators and service companies have trialed the technology including Total, Statoil, Dolphin Energy, Petronas, NIGC and Champion Technologies. What is the accuracy of HydraCHEK? Does HydraCHEK need to be calibrated for each production system we have? If a calibration already exists for the hydrate inhibitor and salt to be measured then the system can be deployed immediately and no adjustments are necessary. For example we have already developed HydraCHEK calibrations for the main thermodynamic hydrate inhibitors (Methanol, MEG, Ethanol), which can be used to detect the inhibitor and salt concentration for any production system, provided the concentrations are within the measurement range of the device and calibration. HydraCHEK only requires calibrating for a system if we have not developed a calibration for the hydrate inhibitor to be detected i.e. a new KHI formulation. What is the effect of fouling due to solids, sand, oil in water etc. on the measurement? The impact on the results will depend on the type and severity of the fouling, however for most cases we have found a simple filtration of the produced water sample is enough to make any effect negligible. Has it been tested in an environment where hydrocarbons i.e. crude oil or condensate is present? To achieve the best possible accuracy it is preferable to have a hydrocarbon free water sample before analysis however our testing has found that small amounts of hydrocarbons present will not affect the measurement as the device is looking at the bulk of the sample. How does the presence of other production chemicals such as scale and corrosion inhibitor affect the results? Most oilfield chemicals are injected in very small quantities (orders of magnitude difference) when compared with hydrate inhibitors so their effect can generally be considered negligible. Does the temperature or pressure of the sample affect the measurement? HydraCHEK samples can only analysed at ambient pressure so this factor is not important. Temperature can be problematic if samples are heating up or cooling down while the measurement is being carried out so should always be allowed to reach ambient temperature before analysing. Will the presence of other salts affect the measurement? HydraCHEK measures the NaCl concentration and considers all other salts present as NaCl. The resulting value is however equivalent to the combined concentration of all salts present. The majority of produced water systems are NaCl dominated and as such the salt measurements are representative. If ion ratios are known for a system a simple conversion from the HydraCHEK measurement can be used to estimate the concentration of each ion. When hydrates form they exclude salts and thermodynamic inhibitors such as MEG and Methanol from their structures. If an increase in the concentration of salts or hydrate inhibitor is detected it could therefore be an indication that hydrate formation is taking place. As described in the SPE paper (SPE166596), Total has used this technique to operate inside the hydrate stability zone, controlling the concentration of hydrate slurry allowing them to extend the life of the NUGGETS field. Produced water consists of condensed water and formation water. Condensed water is the water present in the gas phase at reservoir conditions and is produced as a gas from the reservoir. At some point condensation of the water takes place due to changes in pressure and temperature conditions but the salinity of condensed water is normally very low. Formation water on the other hand is the water which leaves the reservoir as a liquid and does contain salt. Production of saline formation water can have a number of issues associated with it, including; corrosion, water handling capacity, slugging, salt formation, etc. Therefore, it is important to detect formation water production and consider potential techniques to minimise its production as early as possible. HydraCHEK can determine the concentration of salt in produced water and can be used to detect formation water production. HydraCHEK can measure the concentration of both lean and rich methanol or MEG streams before and after regeneration units or gas dehydration processing and can therefore be used to monitor the efficiency and performance of regeneration units. Multi-Phase Flow Meters (MPFM) generally measure two physical properties of the produced mixture. Knowing the relevant physical properties of individual phases (i.e., gas, oil and water) using a combination of experimental measurements and predictions, together with material balance, will enable the calculation of the rate of individual phases. The presence of both salt and hydrate inhibitors can change the physical properties of the water phase, resulting in erroneous readings. HydraCHEK can provide independent information on the amount of salt and hydrate inhibitor in the water and be used to adjust the properties of the water phase helping to improve the accuracy of MPFM readings. The concentration of contaminates in the water for disposal is an important factor for avoiding further problems downstream (e.g., in produced water re-injection). HydraCHEK can measure the concentration of selected impurities and/or simply changes in the properties of the liquid phase to minimise associated problems. In some fields there is no accurate way of determining the rate or quantity of water being produced. HydraCHEK measures the amount of salt and hydrate inhibitor in the produced water and if the rate of hydrate inhibitor injection and the concentration of the hydrate inhibitor in the produced water are known it will enable the operator to back calculate the rate of water production. This could be of particular interest in wet gas conditions where the amount of produced water is too low for accurate measurement by Multi-Phase Flow Meters (MPFM). 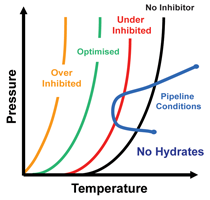 The actual hydrate phase boundary can be determined for a system during operation when using thermodynamic hydrate inhibitors. HydraCHEK is used to measure the hydrate inhibitor and salt concentration in the produced water, which along with the hydrocarbon fluid composition can be input into a thermodynamic model to give the hydrate phase boundary (see our hydrate prediction software HydraFLASH). 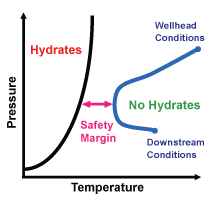 The operating conditions can then be used to determine the hydrate safety margin indicating how well protected a system is from the risk of hydrate formation. Hydrate remediation strategies often involve excessive dosing of hydrate inhibitor, which results in unnecessarily high CAPEX and OPEX costs. HydraCHEK can be used to optimise inhibitor injection rates by providing both a quick and easy way of measuring the degree of inhibition of a system and a means to monitor the effect of lowering the dosage over time. HydraCHEK measures the acoustic velocity and electrical conductivity of a produced water sample and an artificial neural network (ANN) is used to develop robust calibrations for detecting different hydrate inhibitors and salt. The technology has been extensively tested in the field and is in everyday use by major operators around the world. HydraCHEK has been calibrated with a number of different hydrate inhibitors including thermodynamic inhibitors (MEG, Methanol, Ethanol), Kinetic Hydrate Inhibitors (KHI's) and Anti-Agglomerants (AA's). A typical analysis takes less than 30 seconds and no sample preparation is usually required. HydraCHEK also doesn't need any chemicals or consumables to run a test, making it very straightforward to use. All the results are in the mass% range for both hydrate inhibitors and salt, with an effective measurement range of between 0-100 mass% for hydrate inhibitors depending upon the calibration. Hydrate Inhibition Monitoring System - Touch Briefings OIl & Gas Review Volume 9Issue 1 Coming soon!